Christmas is a time for deliciousness. There’s just no doubt about it. And (contrary to what some people might think) that doesn’t stop if you’re vegan, plant-based, raw, paleo, or whatever you might be, if you’re healthy then Christmas can be just as delicious for you too. Whilst many people go crazy for Christmas pudding or mad for mince pies, I’m a chocoholic myself, and definitely that doesn’t stop at Christmas either. 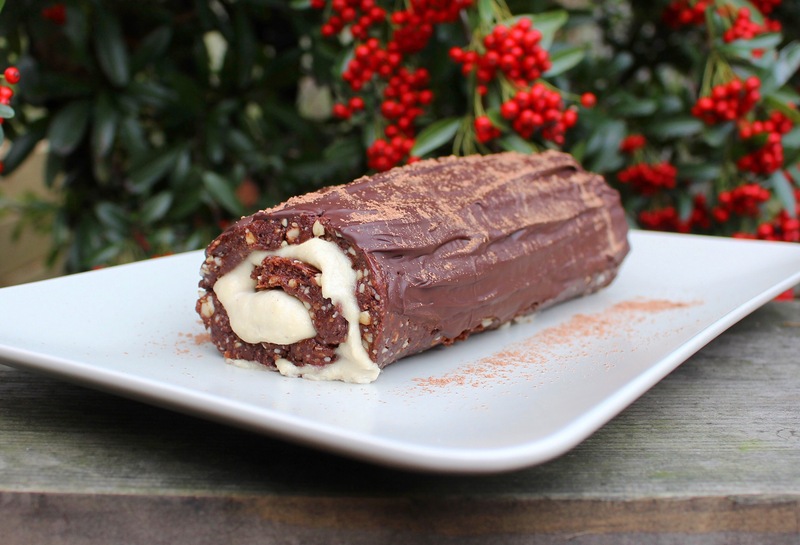 My all time fave Christmas dessert has got to be a yule log, which traditionally isn’t really on the healthy side, so I’ve come up with a healthified version which is just as scrumptious but made without any nasty ingredients. You don’t need an oven for this one, just a food processor or high powered blender, which is great because our ovens are often pretty busy around Christmas time roasting all sorts of amazing things. I’m honestly so excited for Christmas dinner I can’t even tell you! But I’m so happy that now I can be just as excited for dessert too. If I have any room left after mains that is. Oh who am I kidding of course I will. First, to make the log, pop the cashews in a food processor and blitz them for a couple of minutes until they form a flour. Spoon this into a mixing bowl and place the dates in the food processor, again for 1-2 of minutes until they are all sticky and lovely. Add this to the mixing bowl along with the cacao powder and knead for a couple of minutes until all the ingredients are mixed together and you have an amazing chocolatey mixture. Cut a piece of cling film and place it on top of a chopping board, weighing it down at the corners if necessary to make sure it stays in place. 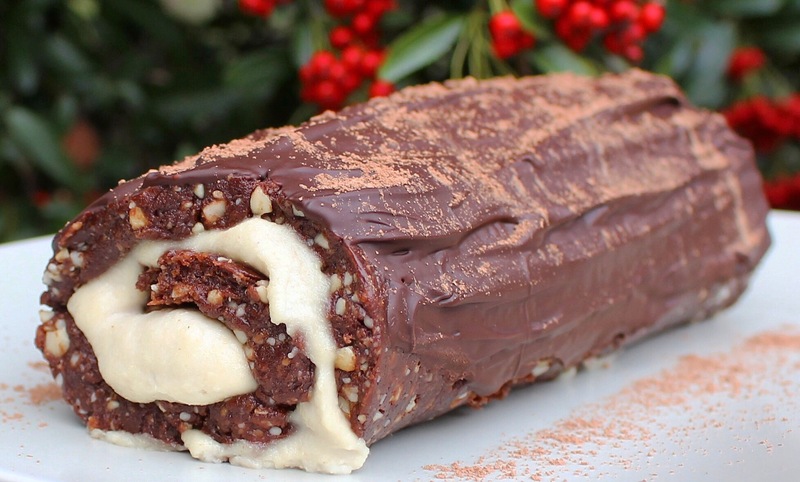 Spoon the yule log mixture onto the cling film and shape it into a big rectangle about 1cm thick. For the creamy vanilla filling, drain the cashews and add them and the other ingredients to a food processor and blend for a couple of minutes until creamy and smooth. Spoon the mixture onto the yule log, leaving about an inch bare on the left side. Now for the rolling – it’s a bit like rolling sushi – using the cling film to help you, start rolling it from the right side until your log is formed! If you’re not sure how to do this (it’s quite hard to explain! ), here’s a short sushi rolling tutorial that will help! Stick the end down with your fingers, using a little water if needed. Cut off the ends with a sharp knife to make it look a little neater and place it in the freezer while you make the chocolate. For the chocolate on top, just melt the cacao butter in a saucepan then stir in the maple syrup and cacao powder. Once it’s all mixed together, remove the log from the freezer and drizzle the melted chocolate on top. Cut into slices and enjoy! Any chance of a response please? I really want to make this for Christmas! Thank you.